This is a 2018 Howie Escape Series fully loaded with Piezo pickups embedded in our patented nautilus shell chambers. 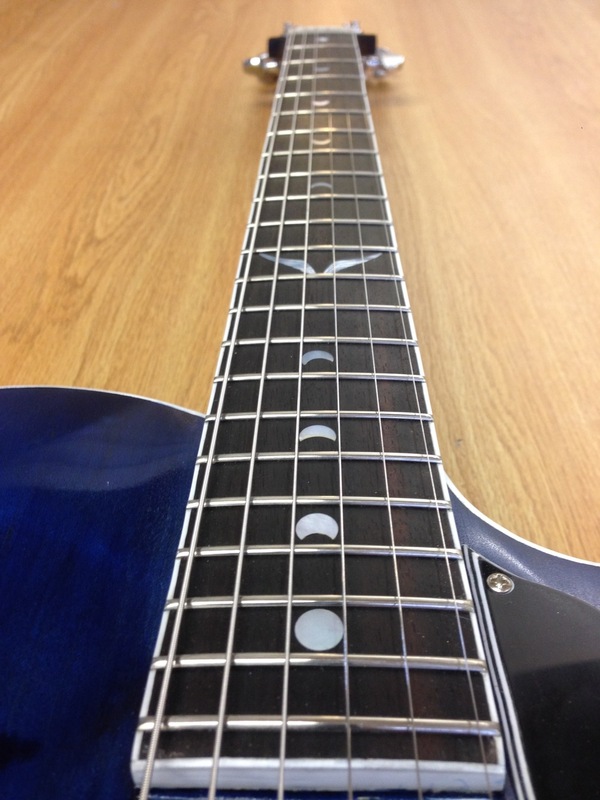 We added a Pre-amp to the Piezos to give them extra volume if needed making them ideal for percussive playing. The normal pickups on this guitar are Bareknuckle Supermassice humbucker sized P90s giving this guitar some serious kick. A 3 way toggle switch at the top of the guitar allows you to switch between the two normal pickups while a smaller DPDT switch allows you to use just the P90s, the p90s and Piezo pups mixed or the Piezo pups by themselves. Please see the video above to get the full details and sound on this guitar. CLICK HERE TO PURCHASE FLORENCE! 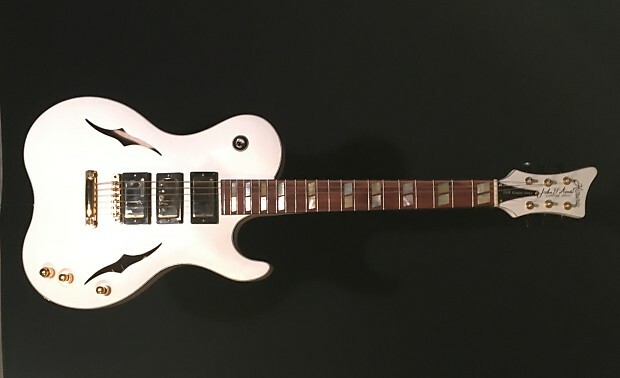 This is a 2018 John D'Amato signature Howie Escape. It comes with a hardshell case and strap. We build these guitars to the specifications of legendary Bluesman John D'Amato. 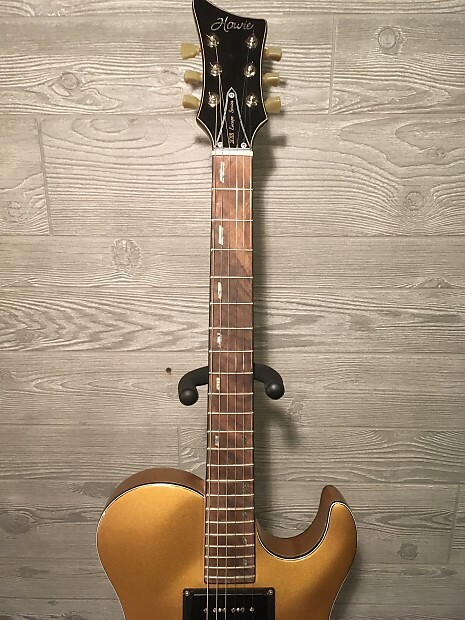 There are many unique aspects to this guitar. A train of 3 aggressive Humbuckers, an extra wide neck, gold pearl double block inlays and a steep neck angle all add up to an amazing blues guitar. 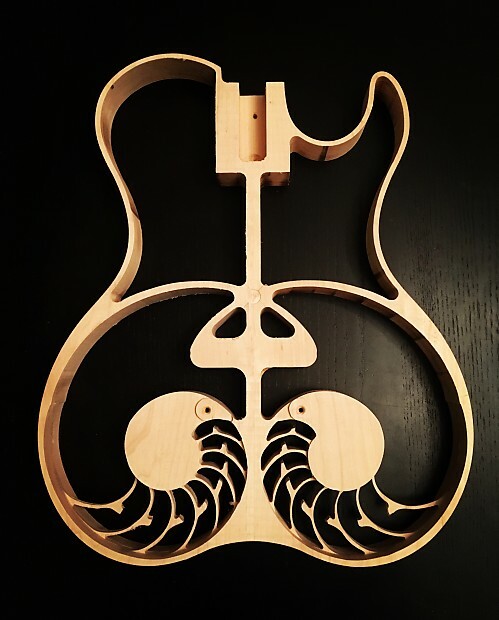 As always, the inside of the body features our patented nautilus shell design giving our guitars the unique Howie tone. You can see the Nautilus design in the last 2 photos above. Check out the video for an in depth run down of all of the special features of this guitar. The body is a carved piece of solid Maple. 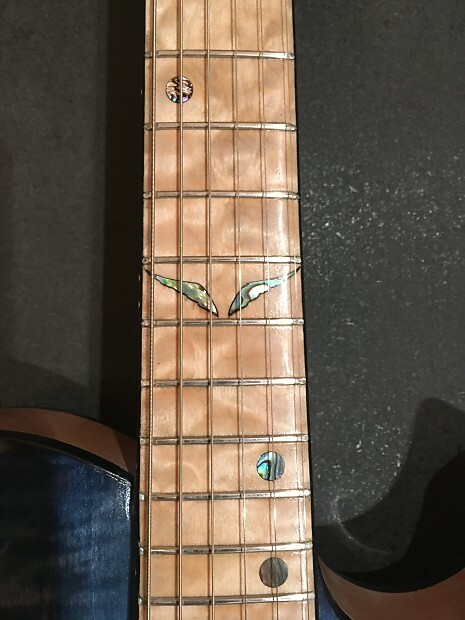 The neck is Maple and the fretboard is figured Walnut with Abalone Inlays. 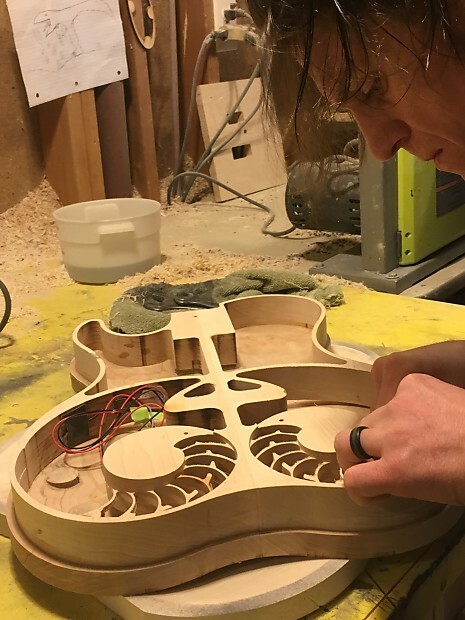 The inside of the body features our patent pending Nautilus shell design and is embedded with piezo pickups. 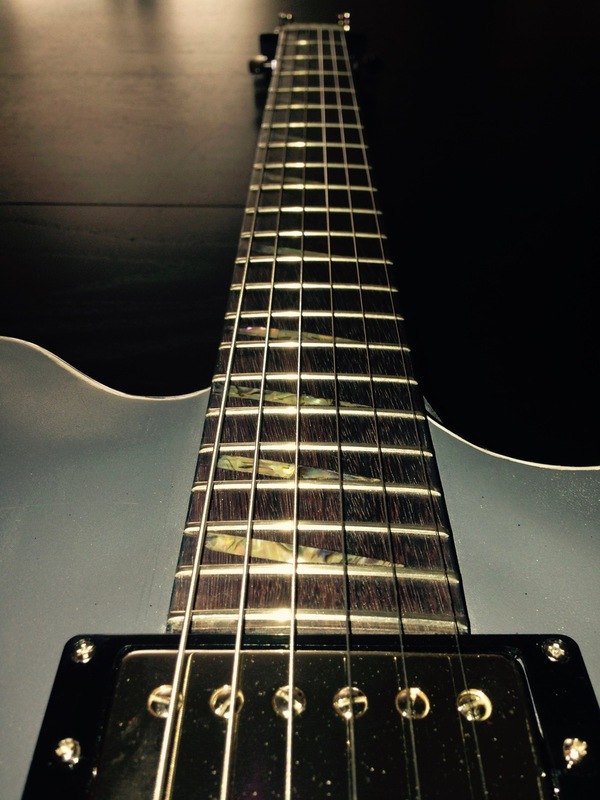 There is a 2nd switch added that blends the piezo pickups with the P90 and humbucker. This Guitar has been lent out to local musicians to demo so it has very minimal ware and tear. This why we have dropped the price. We always name each guitar that we build because we become so close with the guitar through the process. This one is named "Jasmine" after the main character in Andy Weir's latest book. This is the first Howie Escape Guitar built in 2017. 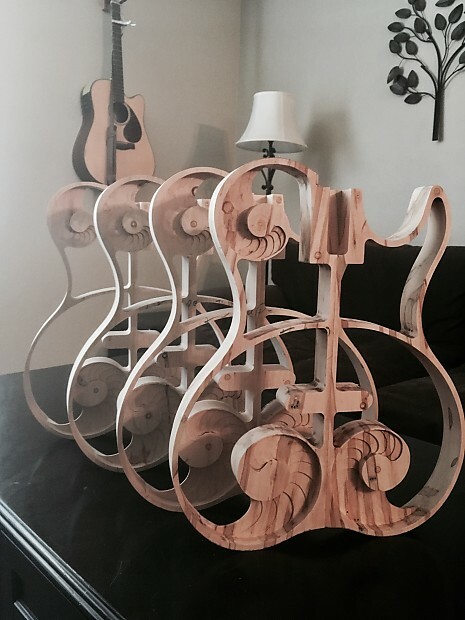 As with all of my guitars it is completely hand built here in Longmont, Colorado USA. Like all of the Howie Escapes, it has a very unique sound because of its nautilus shell body. 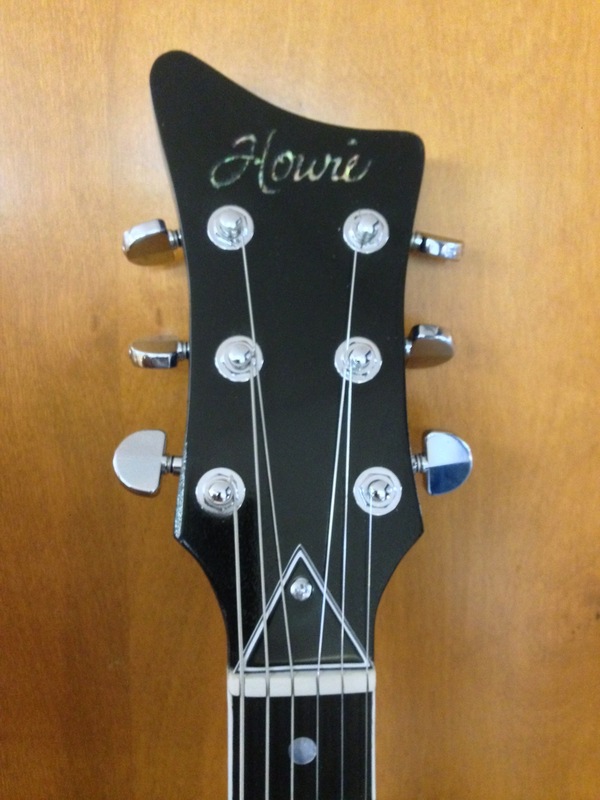 It is also very special because it is the first Howie guitar built with Bare Knuckle Pickups. I can honestly say these are the best pickups I have ever used in a build. They are expensive, but definitely worth it. I have dropped the price a bit because I have played a few gigs with her so she has some very minimal ware and tear. Here are the specifications…. 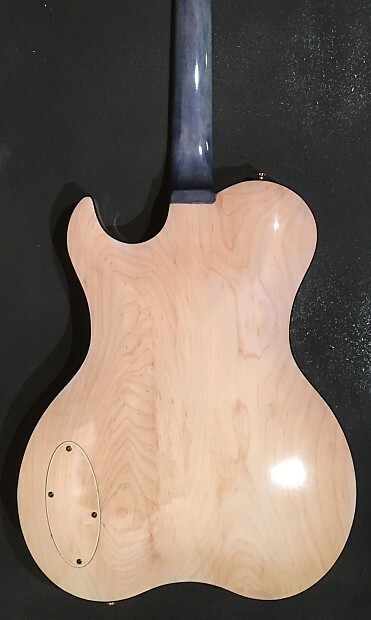 Wood: Hard Maple Body and Back. Quilted Maple top, and Fretboard. This is a classic Howie Escape Series with 3 full nautilus shells inside. (See the 2nd Picture). In the last 2 pictures you can see some flaws in the finish. White is a hard finish to pull off! Because of these we dropped the price quite a bit. As with all of my guitars it is completely hand built here in Longmont Colorado USA. Like all of the Howie Escapes, it has a very unique sound because of its nautilus shell body. 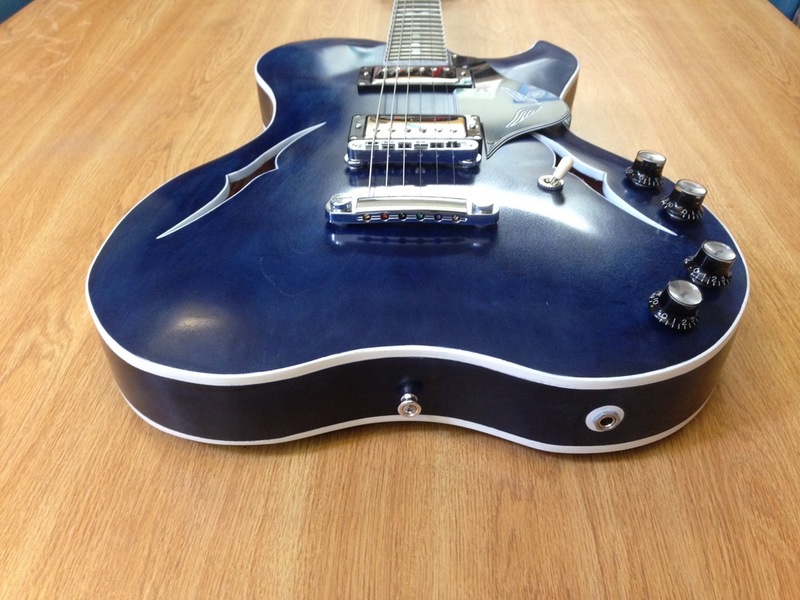 This guitar is special because it is the first Howie guitar built with Kent Armstrong P90 pickups. These P90s are my new favorite on the market. You may have noticed that we name every guitar that we build. This guitar was named after my favorite character in a book I read called Hell Divers. She was a tough and beautiful woman! Here are the specs. Wood: Poplar Body Top and Back, Hard Maple Neck, Ebony Fretboard. This is a brand new 2016 Howie Escape Series guitar that we named Isbell after one of our musical heroes, Jason Isbell. 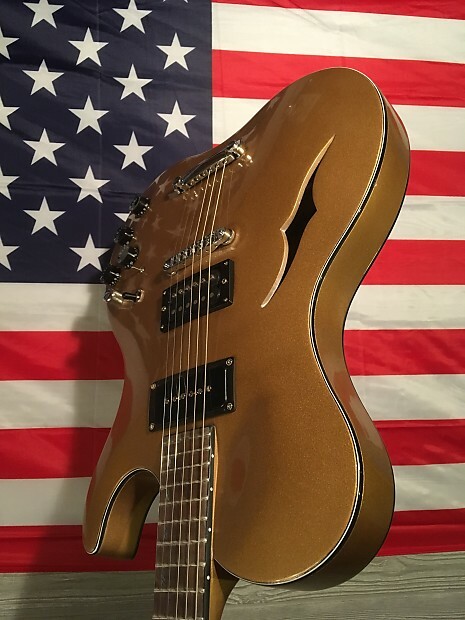 Just like all of our guitars this guitar is completely hand built here in Longmont, Colorado USA. The case and strap are included in the sale. 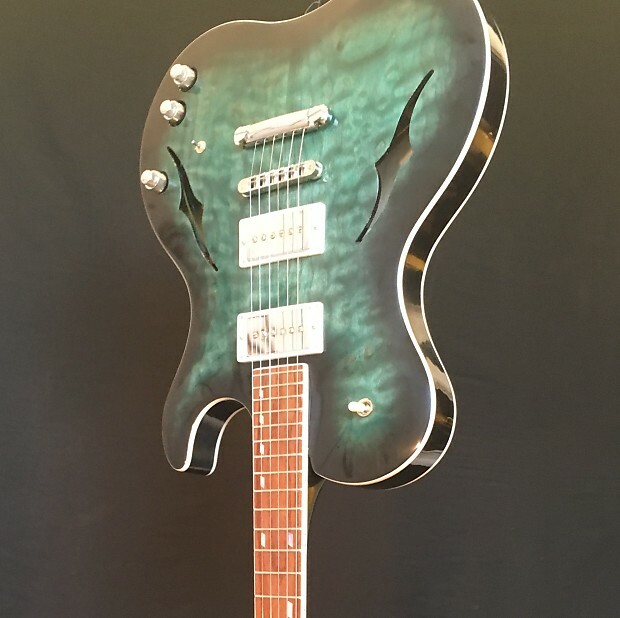 All of my Escape Series guitars have a very unique sound because of the nautilus shell body chambers and the “HOT” Parsons Street Humbucker pickup on the bridge. This pickup is wound extra to 9.5k OHMS to give a wonderful bite while the bridge pickup is a normal wind Parsons Humbucker giving a buttery blues sound. Please check out the video to hear the guitar and learn more about how it was built. This particular escape is unique in that it has double cutaways similar to the Bull Series Bass. It also has a veritone push pull knob giving you two completely different tone variations for all settings. The fretboard of this Escape is unique in that it is built out of Coco Bolo wood and the inlays are made from deer antler. There is a small flaw in the finish on the top side that you can see in the pictures. Here are more specifications…. This is the first of the 2016 version of the Howie Escape series. It is completely hand built in Longmont, Colorado USA. The case and strap are included in the sale. This particular guitar was made with a very thin neck. Different neck dimensions are available by request on custom builds. All of my guitars have a very unique sound because of the nautilus shell body chambers and the “HOT” Parsons Street Humbucker pickup on the bridge. This pickup is wound extra to 9.5k OHMS to give a wonderful bite while the bridge pickup is a normal wind Parsons Humbucker giving a buttery blues sound. Please check out the video to hear the guitar and learn more about how it was built. Here are the specifications…. This is a special version of the 2016 Howie Escape series. It has an added piezo pickup inside the hollow body. It is completely hand built in Longmont, Colorado USA. 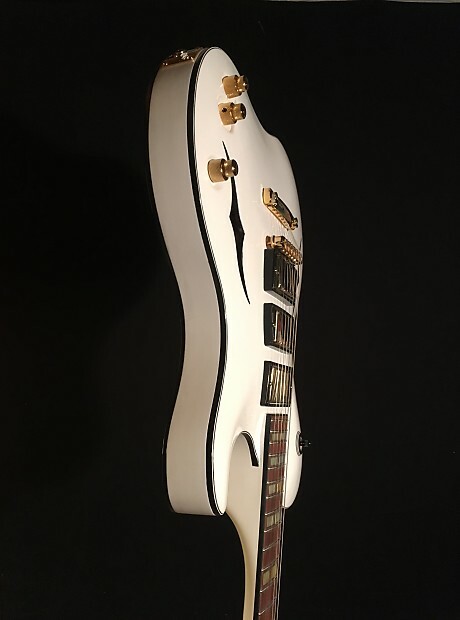 It has a very unique sound because of its nautilus shell body chambers and the “HOT” Parsons Street Humbucker pickup on the bridge. This pickup is wound extra to 9.5k OHMS to give a wonderful bite while the bridge pickup is a normal wind Parsons Humbucker giving a buttery blues sound. Please check out the video to hear the guitar and learn more about how it was built. Here are the specifications…. This is one of my Escape Series semi-hollow body Howie guitars. It is completely hand built here in Longmont Colorado USA. It has a very unique sound because of its nautilus shell body chambers. There are some sand through flaws in the finish you can see in the last picture. Here are the specifications…. This is one of my Escape Series semi-hollow body Howie Guitars. It is completely hand built in Longmont, Colorado USA. 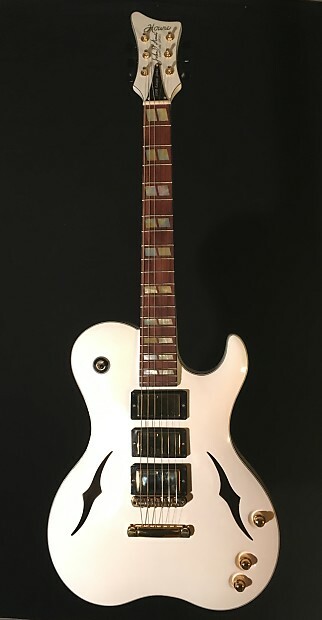 It has a very unique sound because of its nautilus shell body chambers and the “HOT” Parsons Street Humbucker pickup on the bridge. This pickup is wound extra to 9.5k OHMS to give a wonderful bite while the bridge pickup is a normal wind Parsons Humbucker giving a buttery blues sound. Please check out the video to hear the guitar and learn more about how it was built. There are some sand through flaws in the finish you can see in the last picture. Here are the specifications….